James MUIR was born 13 June, 1870 at Beoch Farm, Maybole, Ayrshire, Scotland. He was the third of the ten children of James MUIR and his wife Helen McNAB. At the time of James’ birth, his father James was the farm overseer and was home to register the birth. 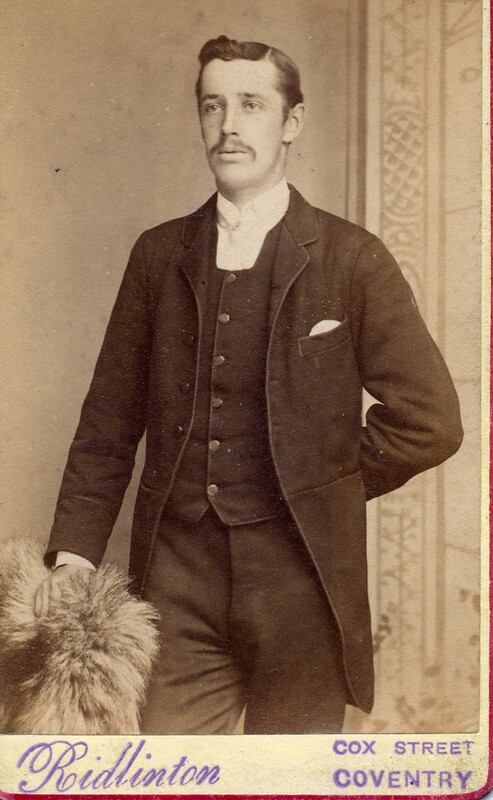 As the second son, James’ name broke with the Scottish naming pattern for children as his mother’s father’s name Kennedy McNAB was not repeated. 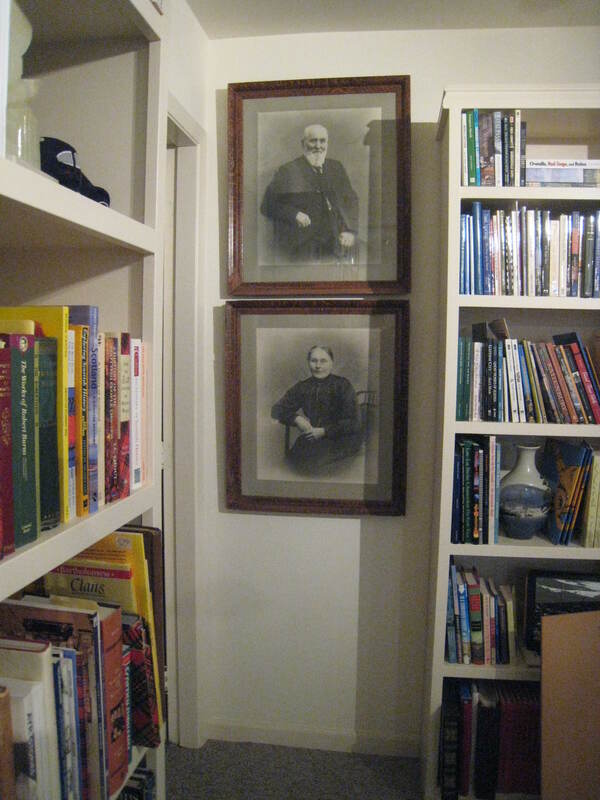 Photo right: James’ parents James Muir and Helen McNab, photo portraits hanging in the author’s home. The portraits are large as can be seen by the 6 foot bookcases. During James’ childhood the Muir family frequently moved as his father continued to seek out employment opportunities that would support his growing family. James, 17 at the time of his sister’s marriage to Tom Watson, would have completed his schooling and would have either found work off the farm, or perhaps was expected to now spend full days as a farmer. In the 1891 census, James, now 20, was not with the family. Where was he? And where to start searching for him? The only clue I had was cryptic note left by my deceased father Thomas Watson ACTON, which said “James (Jimmy) Muir went to England?” My father’s note, including the question mark, was all I had to go on. What had been my father’s source? It would have been his mother Helen McNab WATSON who was James’ niece and who had lived in Scotland during the period of this story. I had another corroborating piece of information, slight as it was. A cousin, Donald SLATER who had been researching independent of my efforts, had produced a family tree that said “Home: England for James MUIR”. Using the theory that there just might be some truth in family stories, I searched the 1891 census for England. This search was more fruitful than I could have imagined. While ‘James Muir’ is an extremely common name in Scotland, it didn’t prove so much so in England. A search yielded several hits for James Muir, however only one was born in 1870 in Ayrshire, Scotland. This James Muir was a greengrocer, who lived at 13 Butcher Row, Holy Trinity Parish, Coventry, Warwickshire, England. 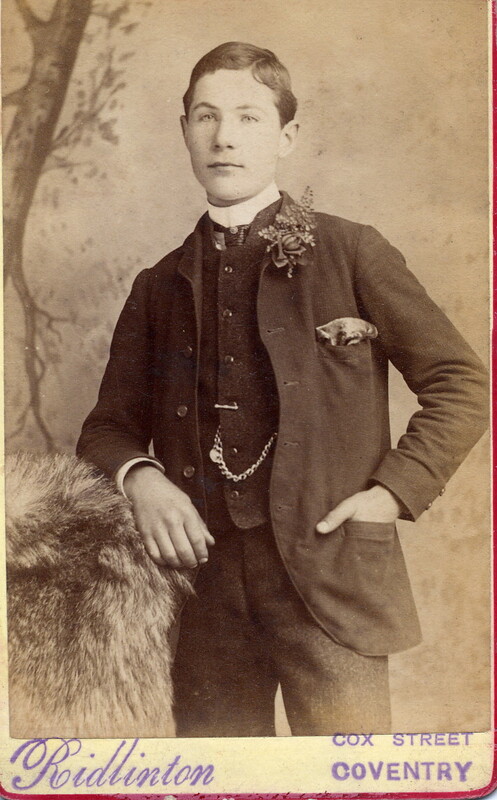 This James, although only 21 years old, was married to a Margaret Helen [surname not given in the 1891 census] with a family of two children: Margaret Helen MUIR (3) and James William MUIR (2). Was this the correct James Muir? And how to tell? Although was not solid proof, I had several pieces of evidence. This James was the correct age and had the correct birthplace. And, if he followed the naming pattern for his children, he would name his first son ‘James’ after his father – which this James had done. This would seem to help point to his parents being James Muir and Helen McNab. However, the James I wanted had grown up on farms. What was he doing as a ‘greengrocer’? Perhaps he had had enough of farming and had decided he wanted to go into business. Perhaps he had never wanted to be a farmer and left the farm as soon as he could. He had at least one Watson nephew (son of his sister Jane married to Tom Watson) who had vowed that he would not “spend his life following the rear-end of a horse that was pulling a plow” with all the inherent dust, flies and horse manure. If James felt this way it may have caused a rift with his father who would have expected him to follow in his farming footsteps. As a result, James may have left Ayrshire for England and the perceived greater opportunities. Seeking irrefutable evidence that this was the correct James in Coventry, I ordered his marriage registration to Margaret Ellen McCUTCHION from the English General Register Office in the anticipation that his parents would be named. No such luck, however several other corroborating pieces of evidence were identified. The marriage, which occurred on 17 January 1888 at the Church of St. David, Parish of St. David, Birmingham, County of Warwick was between 18 year old James Muir, a fishmonger, and 19 year old Margaret Ellen McCutchion. 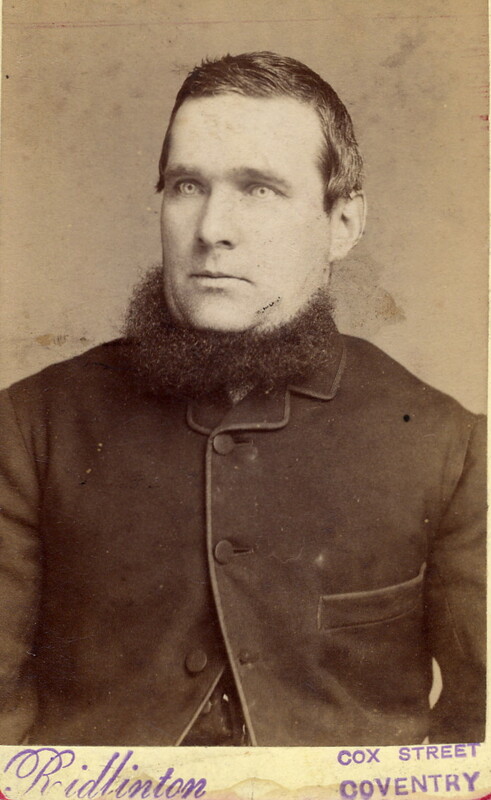 This was the correct age for James (born in 1870), and as a somewhat early age for marriage, it was not likely that the registrar would have made that up. [parental consent was still required for marriages between the ages of sixteen and eighteen; James obviously convinced the registrar that he was eighteen – although technically he wasn’t for another six months]. Also, the groom’s father’s name was listed as ‘James Muir’, which was correct. However, just when I thought the evidence was falling into place, a wrong note; the occupation of the groom’s father, James Muir, was listed as ‘publican’ and I knew that James’ father was variously a farmer, land overseer, bower, retired farmer – but never publican. However the registrar also indicated that Margaret’s father Samuel McCUTCHION (who lived in the same Parish and would have been known to the registrar) had no occupation. Perhaps the registrar: had placed the occupation opposite the wrong name; had not understood James’ accent; or was worse the wear for drink. Or, perhaps James, in order to look more presentable to his future father-in-law, had not mentioned that his father was a farmer, but instead enhanced his father’s occupation to that of a business to make himself a more suitable son-in-law. All these are possible. I had one other piece of evidence that now fell into place. I have mentioned throughout these stories the box of unnamed photos that I had inherited. As explained in an earlier post, I knew from the provenance of the box that it had belonged to my great-grandmother Jane (Muir) Watson, and that no photos had been added that did not relate to the MUIR or WATSON extended families. Some of the most puzzling ones had been taken by a photographer in Coventry, England. I also knew from the considerable research that I had done to that point in time that I had not identified any families had connections to ‘Coventry, England’. Are these photos sent by James of his family to his sister Jane? Are the top two photos of Margaret and James on their wedding day, dressed in all their finery? I hope that someone who reads this story will have a similar photo, or one that can be used for comparison for identification purposes. James continued to live in Coventry for the rest of his life. In the 1901 census, James, 30, born in Scotland (right age, right birthplace) was now a cab proprietor. He and his wife Margaret Ellen and their four children lived at 17 Chapel Street, Coventry, Warwickshire. As well as the two children identified in the 1891 census, Margaret Ellen (12) and James William (10), Harold David MUIR (2) and Evelyn Victoria MUIR (2 months) had joined the family. James in-laws also lived with them: Samuel McCutchion, 56, fish merchant and his wife Sarah, 47. In the 1911 census, James, 41, born in Ayr, Scotland (right age, right birthplace), still lived at 17 Chapel Street, Coventry. He was a widower. He was a motor mechanic, as was his son, 21 year old James William. His eldest child, 22 year old Margaret Ellen was a fish saleswoman. His other children Harold David, 12, Evelyn Victoria, 10 are identified, also Reginald Gilbert MUIR, 7 had joined the family since the 1901 census. His birth in 1904 places the death of James’ wife Margaret Ellen to the 1904-1911 period. I have not identified James’ date of death, however a search of Coventry records (since James showed no signs of leaving Coventry) on Ancestry.com free BMD index has a James Muir, died 1947, 77 years old (right age for birth date of 1870) (Source: Registration District Coventry, Warwickshire, volume 9c, Page 634) Hopefully someone will have a copy of his death registration with both his parents identified. 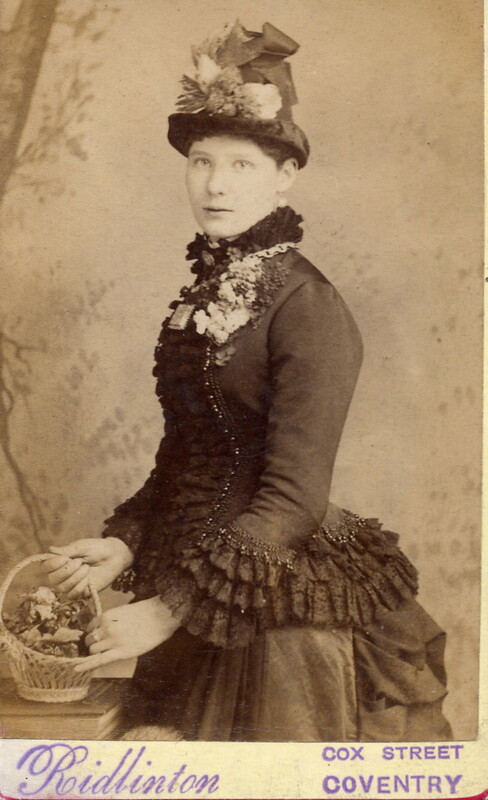 Margaret Helen MUIR b: Bet. July–September 1888 in Coventry, Warwickshire, England, d: Aft. 1914 in Coventry, Warwickshire, England? married Walter H. WOODROFFE m: Bet. January–March 1914 in Coventry, Warwickshire, England. James William MUIR b: Abt. 06 December 1889 in Coventry, Warwickshire, England, d: Bet. October–December 1971 in Coventry, Warwickshire, England? married Sarah E. HUGHES m: Bet. October–December 1912 in Coventry, Warwickshire, England. Harold David MUIR b: Bet. July–September 1898 in Coventry, Warwickshire, England, d: Aft. 1924 in Coventry, Warwickshire, England? married Drusilla HOLLICK m: Bet. April–June 1924 in Coventry, Warwickshire, England. Evelyn Victoria MUIR b: Bet. January–March 1901 in Coventry, Warwickshire, England, d: Aft. 1922 in Coventry, Warwickshire, England? married David ALLUM m: Bet. July–September 1922 in Coventry, Warwickshire, England.